I started my career as a biologist at the University of Wisconsin in Stevens Point. There I was heavily involved in our student chapter of The Wildlife Society, and volunteered on a number of projects including owl and woodpecker banding, carnivore tracking surveys, and small mammal trapping. During this time, I also spent summers doing field work with private and public agencies, where I solidified the skills I was introduced to in my education. I knew I wanted to continue on to graduate school, and looked at a wide variety of labs focusing on ecology. When I found Dr. Aviles at UBC, I was immediately drawn to the research questions pursued by her lab. Social behaviour is such an interesting and important aspect of the biology of many animals. But at this time, I didn’t particularly love spiders. I took a leap of faith and went to Ecuador to start work the summer before my first semester at UBC. It only took two weeks for me fall in love with spiders. They are fascinating and weird and the more I learned the cooler they became. Not only that, but my eyes were opened to the whole world that exists at a much smaller level than us. Now, I am constantly advocating for spiders, and I try to dispel the fears of those around me. 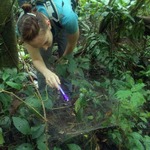 That first field season in Ecuador, I helped another graduate student with his project dealing with nest associates of social spiders. These are other spiders that live within the social spider nest, using it as their habitat. There are entire communities of spiders using these “habitat patches”. There we learned that some associates are commensal, while others are parasitic. I already have a framework for understanding how these parasites interact with social spiders, and am using this framework to jump off into my own project. Samantha's projects haven't shared results yet.